Egeria has 4 - 6 leaves per whorl and no midrib teeth. Egeria has dark green, lance-like leaves that are in whorls of 4 to 6 which become more dense near the tip of the stem. 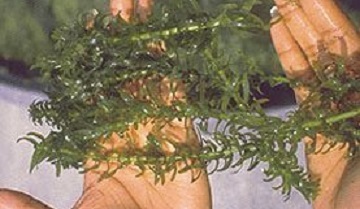 Egeria is often confused with the native Elodea or the non-native Hydrilla. Hydrilla has one or more teeth on the underside of the midrib, neither Elodea nor Egeria have these midrib teeth. The teeth make Hydrilla feel rough when drawn through your hand from base to tip. Flowers of Egeria are larger than Hydrilla. Egeria leaves are larger than elodea and in whorls of 4–6 and not 3 as with Elodea. Egeria is a weed native to South America and has become naturalized in the Southeastern part of the United States in lakes, ponds, pools, ditches and some streams in Texas. Although it is a rooted plant, it can survive and grow in fragments. Some duck species use Egeria as a source of food. Avoid transferring Egeria to other bodies of water. Dibrox® and Spritflo® herbicides will treat Egeria. Alternative treatment products include Aquathol Super K and Hydrothol. You can order these products on the website.